Crossing Condotti is just minutes from Rome’s most famous monuments, buildings and piazzas in the city center. We have put together a list of some of our favourite spots to eat, drink and visit. Always remember that you can ask Davide or Francesco for personalized suggestions and help making reservations if you wish! For breakfast overlooking the Temple of Hadrian. The Gran Caffè serves traditional Neapolitan coffee in the heart of Rome. A small bodega with a range of tasty sweet and savoury snacks and pastries, yoghurt, dried fruit and cereals. A healthy choice for the health conscious traveler. La Buvette is a short distance from Crossing Condotti and offers quiet calm outdoor seating. A great local venue known by Romans and not commonly visited by tourists this place gives you a quintessential Roman breakfast experience with top quality products and service. Many boutiques in the center of Rome use La Buvette for their catering. This is the place to try a real Roman sandwich. Located just a few steps from the parliament building it is common to find yourself in a crowd of tourists and politicians all enjoying a quick sandwich together. Among the best ice-cream parlors in the center of Rome, especially if you want to experience interesting flavours. Try their tobacco leaf flavoured cones or the black rice, panettone, lavender or rosemary flavoured gelato. Experiment with the options and let us know what you thought! The best maritozzo pastry to be found in Rome as certified Davide, Francesco, Lara, Fatima and all Crossing Condotti guests who gave into temptation and experienced this pasticceria’s freshly baked maritozzo. If you are craving a gourmet sandwich or a healthy dish this is the place for you! The interior is entirely white with splashes of colour from the green of the indoor plants and the bright colours of the exotic fruit. This is a classic Roman Osteria where you can get your fill of all things quintessentially Roman: carbonara, amatriciana, tripe and ox tail. You might return home a pound more on the scales but it will be a pound of pure joy, we promise! Tradition and innovation come together with a combination of flavors and culinary techniques to create shapes, textures and colors of traditional recipes. This is a refined dining experience recommended for important appointments or meetings. If you are looking for fresh pasta this is your place. Fresh homemade pasta made with the traditional Roman method. This is a small space with very few tables. Our in-house expert Francesco has plenty of suggestions on what to order so check with him for recommendations! If time permits, do not miss your chance for a drink with a view of some of the most stunning sights in Rome. The location really is of incomparable beauty, surrounded by the greenery of Villa Borghese. This vintage bar has maintained its charm over the years. This trendy bar entertains its guests with live music. You cannot walk past without being drawn in, just ask Davide who finds himself being sucked in every time he passes by! This is a great choice for a classic Roman aperitivo. Roman personalities often meet here for a drink in the early evening. The design is inspired by the past with furniture from the '20s and 50s. Sit back, relax, end your day with an aperitivo drink and take in the view of the Temple of Hadrian. Mediterranean cuisine ideal for a romantic dinner in the heart of Rome. The sommelier is extremely knowledgeable and they maintain a wide selection of quality wines to give you the chance to try something new, you will not be disappointed! If you are celebrating or want to have a special dinner, Glass Hostaria is ideal. Earning the restaurant a Michelin star chef Cristina Bowerman’s use of high quality products and culinary finesse will not disappoint! The interior is tastefully decorated with local design. Molto has an elegant, refined atmosphere, and is a great choice to enjoy some high end dining. They specialise in Italian rotisserie dishes, options include: free-range chicken, rabbit, duck, suckling pig, game, quail or leg of lamb. The Michelin stared chef Nino Graziano will take you on a food and wine journey of unique flavors and aromas. Specialising in fish and seafood, the Osteria Siciliana serves ‘reinterpreted antique recipes’. Renato e Luisa has an informal and familiar vibe. By reworking ancient flavours and traditional cuisine, the food is made lighter and tastier. Take your time to enjoy their seasonal products including extra virgin olive oil and bread, breadsticks and homemade desserts. This small contemporary-style restaurant is great for a fresh seafood dinner in the heart of Trastevere. Trastevere is a lively nighttime area which is fun to explore, you will find students, lovers and locals all gathering together to meet and enjoy the evening. This historical bar never loses its charm for both tourists and Romans alike. It is a popular after dinner spot for people of all ages. This whisky bar hosts different live music acts nightly. Il Margutta is a vegetarian institution in Rome which first opened its doors back in 1979. It is located in Via Margutta, a cozy street of antique dealers and artists. This restaurant was recreated inside the Monte dei Cocci, behind the Macro Testaccio. Ketumbar serves inspired vegetarian dishes which satisfy strict vegetarians and flexitarians alike. 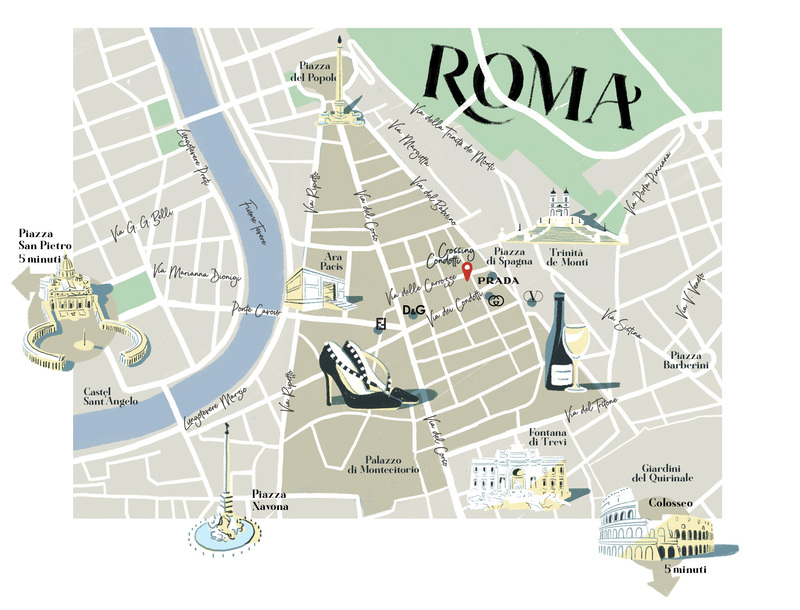 Emporio Roma is full of designer pieces and furniture from both Italian and international companies. Brands include De Padova, Boffi and Ingo Maurer as well as items from lesser known companies handpicked by Emanuela, the store owner. Nora P is a vintage furniture store where you will find designer objects from the 40s, 50s, 60s and 70s. It is intriguing to take in the furniture and enjoy a journey through the ages of design. You will come away wanting to fill your home with new designer pieces! This historic boutique in Via Vittoria has been a top pick for international clientele for over 30 years. A shopping destination unto itself this boutique is housed inside a historic mansion and has a range of garments, tailored pieces, classic brands and emerging brands. Piccadilly is a boutique nearby the Sistine Theatre for childrenswear shopping where Romans go to purchase an outfit for special occasions. Local clientele have been going there for generations to pick out beautiful coats with a velvet collar, kilts or an intricate one piece for a baby. As one of the oldest bakeries in Rome, you cannot visit without trying their delicious flat red Roman pizza. Their products are unparalleled and after you have visited once, you will keep going back! Since 1932 Castroni has been stocking roasted coffee, oils, wines, exotic foods, sweets, teas, drinks and liqueurs from all over the world. This is the most famous food and ingredients store in the city. If you are undecided about what gourmet souvenir to buy Davide and Francesco are full of suggestions and recommendations. Stock up on gourmet meats, cheeses, truffles and much more at the Salsamenteria fratelli Fabbi. This historic barbershop has been in business since 1957! Located just around the corner in Piazza di Spagna this is where Roman nobility go for a haircut or a beard trim. Many Roman ancient monuments and famous places of art are waiting for you just past the doorstep of Crossing Condotti. Take a stroll and you will come across all manner of attractions and monuments. In case you want to visit some lesser known locations and sites, Davide and Francesco have created a list of suggestions so that you have a unique story to tell about your trip when you get home. The Appia Antica is the old Roman Appian Way dotted with ruins, old houses and catacombs. A visit to this archeological and nature park is a pleasant change from the city center. The mausoleums, sepulchers, towers and tombs are a unique testimony to the grandeur of Rome. Rome has over 900 churches each worth visiting for its own history and beauty. If you can’t quite make it to all 900, we recommend these three, which are quintessential examples and intriguing from both inside and out. The Palazzo Doria Pamphilij hosts an extensive and very majestic collection of paintings, furnishings and statues. Look out for the artist’s signature on the works, you will find yourself in the company of Tintoretto, Tiziano, Raffaello, Caravaggio, Bernini, Velazquez and many others. This palazzo is close to Piazza Navona. One of four sites of the National Roman Museum is currently housed within this magnificent architectural setting. This particular branch of the museum is dedicated to the history of collecting. This ideal sunset spot is for the romantics out there. Take in the lights, colours and silhouettes, it is a mind, body and soul experience! The Quirinale is without doubt a symbol of the Italian state. Located on a hill also named Quirinale, this grand building was the official residence for the King of Italy from 1870. In 1946, the Quirinale became the official residence for the President of the Italian Republic. Most recently, in April 2018, Italian President Mattarella inaugurated the opening to the public of the main floor, the pot, the carriages and the gardens. This is one part of the underground route that extends below the Trevi district. The Trevi Fountain is of course one of the icons of Rome, but this archaeological area will take you through the different eras of the history of the city. A rare experience not to be missed. If you have a few extra days in Rome, or would like to discover some off the beaten track gems, we recommend Villa d’Este or Gardini di Ninfa. This is a beautiful English garden, created on the ruins of the medieval city of Ninfa. With over 1000 different plant species, Giardini di Ninfa are a must see if you like visiting gardens and estates. Not only does Giardini di Ninfa come highly recommended by Davide and Francesco, but the New York Times also celebrated them as "the most beautiful garden in the world" in 2010. Villa d'Este is a UNESCO World Heritage Site and rightly so. This villa is a masterpiece of Italian renaissance prestige with its enchanting gardens and hundreds of fountains and frescoes. Our "boutique hotel" is at the center of the Eternal City. Ancient Roman beauty surrounds you from all angles, from simple street corners to boutiques, restaurants, bars the most famous monuments of Rome, we are in the heart of an unforgettable city waiting to welcome you on your unforgettable holiday. Check out the map, see what is close by, and start exploring!